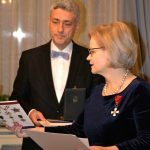 On 6 December 2017, Professor Jan Čermák and the chairperson of the Scandinavian House in Prague Mgr. 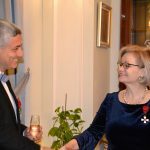 Michal Švec received the Order of the Lion of FInland from the Ambassador of Finland to the Czech Republic, HE Helena Tuuri. 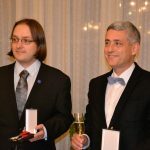 Professor Čermák and Mgr. 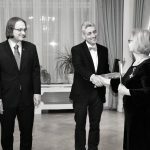 Švec received the prestigious order for promoting Finnish culture in the Czech Republic. The Order of the Lion of Finland (Suomen Leijonan ritarikunta) was founded in 1942. 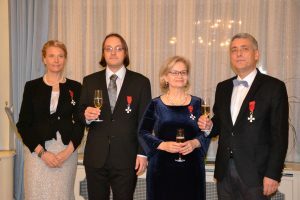 It is awarded for civilian and military merit both to Finnish and international citizens. Prof. PhDr. Jan Čermák, CSc. (1962) is a renowned Czech scholar specialising in English historical linguistics and medieval literature. He is Professor of English at the Faculty of Arts, Charles University. Apart from English and Czech, he also studied Finnish, and recently, he has been working on the Finnish national epic „Kalevala“. He has prepared the most recent Czech edition of the epic, for which he wrote extensive commentaries and essays. 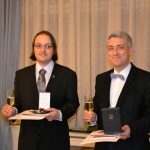 In 2015, Professor Čermák received the „Epic Prize“ (Eepos-palkinto) from the Finnish Kalevala Society. 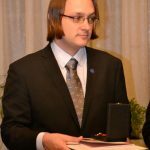 Michal Švec (1984) is a graduate of Classical Archaeology and Finnish at the Faculty of Arts, Charles University, where he currently pursues a PhD in Comparative Literature. Since 2008, he has served as the chairperson of the Scandinavian House, a Nordic cultural centre in the Czech Republic. Under his leadership, the Scandinavian House has organised hundreds of events and it has founded a unique library of Nordic literatures. Mgr. Švec also translates from Finnish and focuses on Finnish literature and film. The Scandinavian House (Skandinávský dům) is a Czech non-profit organisation which endeavours to promote the culture of the Scandinavian countries in the Czech Republic.